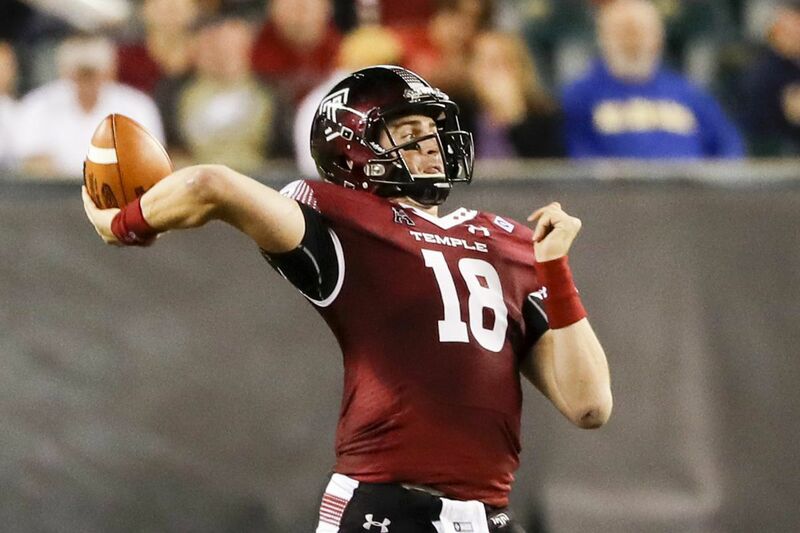 Temple quarterback Frank Nutile throws a pass during the third quarter against Navy. Temple quarterback Frank Nutile earned his second straight start in place of injured Logan Marchi on Thursday night. He's making quite a pitch to permanently keep the job. A redshirt junior, Nutile led the Owls to scores on their first six possessions in a 34-26 win over Navy in an American Athletic Conference game at Lincoln Financial Field. The 6-foot-5, 225-pound Nutile completed 22 of 30 passes for 289 yards with four touchdowns and one interception. "When they are doing a great job coaching and great job running, a great job pass protecting and the receivers are running unbelievable routes, it makes my job really easy so those guys really help me out," Nutile said. Nutile is humble, but he made some great throws, hitting a wide open Adonis Jennings in stride for two touchdown passes of 40 and 34 yards. Jennings had five receptions for 127 yards and the two scores and wideout Keith Kirkwood had a season-high seven receptions for 87 yards and a touchdown. The Owls took advantage of one-on-one matchups with smaller corners on both 6-foot-3 receivers. "Me and Keith are two different wide receivers so just going into the lineup with two 6-3, 200-plus pounds guys that has different stuff to them,, it definitely throws the corners off and I am happy we have the receiving corps that we can mix and match with different talent," Jennings said. Temple improved to 4-5, 2-3 in the AAC, while Navy (5-3, 3-3) lost its third consecutive game. The Owls had to hold off a late comeback by Navy, which cut the deficit to 34-26 when backup quarterback Garret Lewis hit Tyler Carmona with a scoring pass on a fourth-and-goal from the 8-yard line with 2 minutes, 12 seconds left. Kirkwood then recovered the onside kick attempt and the Owls ran out the clock. This was a rematch of last year's AAC title game that Temple won, 34-10 at Navy. It was the second game in a row that Temple had played a triple option attack after a 31-28 overtime loss at Army on Oct. 21. Led by defensive end Sharif Finch, who had two sacks, the Owls did a good job bottling up a Navy attack that entered the game leading the nation in rushing, averaging 376.1 yards per game. Navy was limited to 136 yards rushing. Navy quarterback Zach Abey snapped a streak of eight straight games rushing for 100 or more yards dating back to last year. He rushed for 60 yards on 25 carries. "Against a quarterback like that, everybody has to do his job and not deviate from it," Finch said. In other words, the Owls didn't over-commit, often forcing Abey to run inside. After falling behind 34-13 on Aaron Boumerhi's 33-yard field goal with 10 minutes and 27 seconds left, Navy had to go to the air. The Midshipmen threw for a season high 225 yards and three touchdowns. Lewis, in relief of Abey, threw two fourth quarter touchdown passes. Unlike last game when the Owls allowed a game-tying touchdown pass with one second left in regulation, Temple was able to hold on while facing their second straight triple option team. A key in the third quarter came when Temple immediately rebounded after Navy used some razzle dazzle to cut the lead to 24-13. Slot back Darryl Bonner took a direct snap and lateraled to Malcolm Perry, who threw a 5-yard touchdown pass to quarterback Zach Abey with 6:05 left in the third quarter. Nutile came right back, hitting Jake Robinson for a 3-yard scoring pass, the first career reception for the redshirt sophomore tight end from Haddonfield. That completed an 11-play, 81-yard drive, giving Temple a 31-13 lead with 57 seconds left in the third quarter. The big play was a 33-yard completion to Jennings to the Navy 1-yard line. When Boumerhi added the fourth quarter field goal, it looked like a breeze, but little has come easy for the Owls. "I said even with our three close loses we are a really good football team," Temple coach Geoff Collins said. "The things we have learned with a young football team helped us propel tonight."